T.D. Jakes grew up modestly in a small West Virginia town, but his upbringing wouldn’t stop him from reaching stardom in the name of God. Jakes, who was nicknamed ‘The Bible Boy” at a young age, knew he was destined to preach in the name of his Lord. Throughout his career as a minister, he has published over 30 books and helped countless individuals improve their life by teaching about purpose, forgiveness, and faith. On June 9th, 1957, Ernest and Odith Jakes gave birth to their third child, a boy, in the town of Charleston, West Virginia. Ernest, who was an innovative entrepreneur, owned a janitorial business that seemingly cleaned every business in the Charleston area. Odith was a economics professor who passionately instilled educational values in all of her children. In 1957, Ernest, Odith, their daughter Jacqueline, and their first son Ernest Jr., would welcome the last member to the Jakes family, Thomas Dexter Jakes. Growing up on the outskirts of Charleston, in the small town of Vandalia, few would have predicted the massive impact that their youngest son, nicknamed T.D., would make on the world. At a young age, the youngest Jakes was referred to as, ‘The Bible Boy,’ and he came to believe, in his adolescence, that he was called to preach in God’s name. Although Jakes was fearful to speak in front of large groups initially, the enormous reactions of his crowds gave him the confidence to continue to pursue a life dedicated to the work of God. During his teenage years, T.D. was tasked with tending to his invalid father and worked in various local businesses before enrolling at West Virginia State University in hopes of fulfilling his dream of becoming a minister. Soon after enrolling in WVSU, however, Jakes took a job at the local Union Carbide, which postponed his ultimate goal. During his time at Union Carbide, he did continue preaching part-time and met his future wife, Serita, who he is still happily married too. 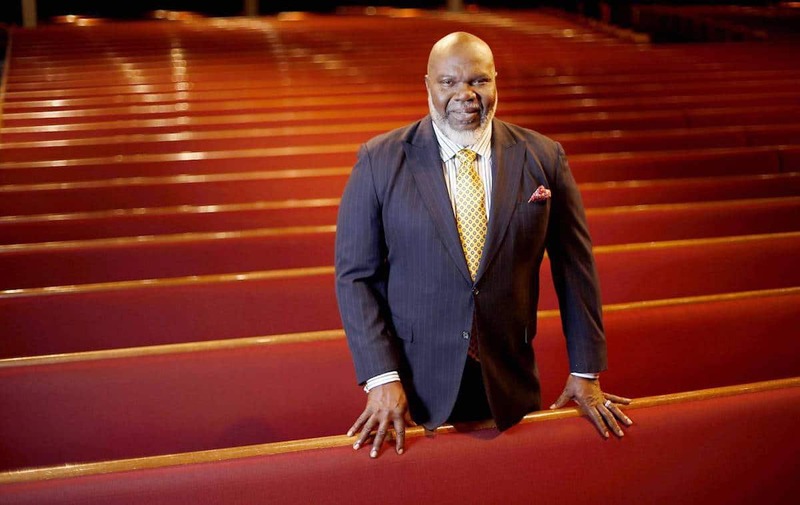 It was in 1982, at the age of 25, that Jakes got the opportunity to become the pastor of the Greater Emanuel Temple of Faith Church, which saw rapid congregational growth under his leadership. The congregation grew from a mere 10 members to over 300, which forced Jakes to move the church to 2 different locations. It was also in 1982 when Jakes started a radio ministry program called, “The Master’s Plan.” Jakes’s reputation for being a powerful orator continued to grow and he eventually decided, with the guidance of Bishop Sherman Watkins, to open his own church in Charleston. The move to Charleston allowed Jakes to continue working towards his educational and spiritual goals. In 1993, he self-published “Woman, Thou Art Loosed,” which documented an outreach program he started and ran, under the same name, where he worked with women victimized by abuse. The book became a religious best seller and put Jakes on the national map. During his time in Charleston, Jakes also started a nationally televised ministry program, created his non-profit organization T.D. Jakes Ministries, and graduated with a Doctrine of Ministry. In May of 1996, Jakes, his family, and 50 other families who worked with Jakes’s organization, moved their congregation to Dallas, Texas, after T.D. had the opportunity to purchase the Eagle’s Nest Church. Jakes quickly renamed the church, calling it The Potter’s House, and used the additional space and land to expand his growing ministry operations. Today, his congregation consists of over 30,000 members. While Jakes is primarily focused on preaching the word of God, he has been able to make a major impact on communities, throughout the United States, in a variety of ways. T.D. Jakes Ministries has many outreach programs that help individuals who have been victimized by homelessness, addiction, and prostitution. He also has programs dedicated to helping the youth, working with prisoners, and helping individuals who suffer with weight issues. Jake’s has received numerous awards. In 1997 he received Dallas’s Key to The City and in 2001 he was named America’s Best Preacher by CNN and Time. Since the 90s, he has published over 30 books, including: “Destiny: Step into Your Purpose,” “Instinct: The Power to Unleash Your Inborn Drive,” and “Healing the Wounds of The Past.” The previously mentioned, “Woman, Thou Art Loosed,” ranks as one of the top selling religious books ever published. While his main message is to promote the Lord, he has been able to help countless individuals realize their value through his personal growth and development teachings.